For most kids, a scientist is a person who wears a white lab coat and works with strange instruments in a lab. But in reality, there are hundreds of types of scientists. 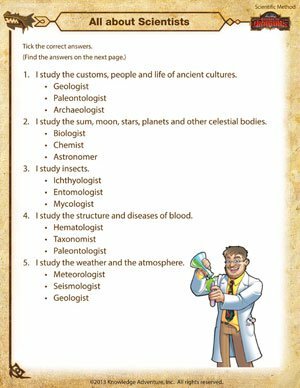 Use this fun online scientific method worksheet to help your child learn about the different kinds of scientists out there. And when he’s done, get him started on these printable scientific method activities for kids of all ages on School of Dragons!